Revenue in the Dating Services segment amounts to US$1,049m in 2019. Revenue is expected to show an annual growth rate (CAGR 2019-2023) of 3.3%, resulting in a market volume of US$1,195m by 2023. The market's largest segment is Matchmaking with a market volume of US$574m in 2019. In global comparison, most revenue is generated in United States (US$1,985m in 2019). The eServices market segment Dating Services contains the user and revenue development of three service categories: (1) Matchmaking, (2) Online Dating and (3) Casual Dating. Dating Services are generally characterized by their search functionality which enables its users to establish interpersonal relationships via the internet. This includes the focused search for life partners, flirts or sexual partners. Both dating portals and apps are incorporated into the examination. The Matchmaking market segment contains dating services for the systematic search for partners who are willing to enter into a long-term committed relationship by means of mathematical algorithms. The market segment of Online Dating is made up of online services that offer a platform on which its members can flirt, chat or fall in love. Two examples are Neu.de and POF, these platforms focus on casual contacting and easy flirting among its members. Casual Dating comprises online services for the establishment of sexually oriented contacts outside of romantic relationships. Reading Support Revenue in the Dating Services segment amounts to US$1,049m in 2019. 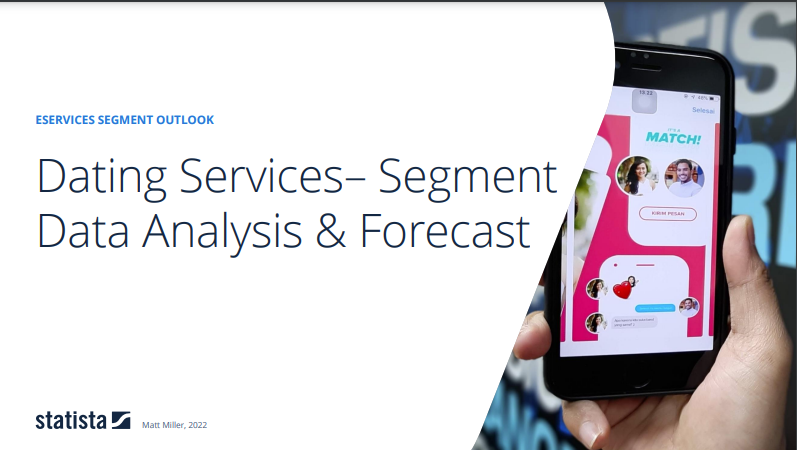 Reading Support The Dating Services segment is expected to show a revenue growth of 4.7% in 2020. Reading Support In the Casual Dating segment, the number of users is expected to amount to 12.5m by 2023. Reading Support User penetration in the Dating Services segment is at 9.1% in 2019. Reading Support The average revenue per user (ARPU) in the Casual Dating segment amounts to US$16.41 in 2019. Reading Support In the year 2017 a share of 40.8% of users is 25-34 years old. Reading Support In the year 2017 a share of 74.1% of users is male. Reading Support In the year 2017 a share of 39.2% of users is in the high income group. Reading Support With a market volume of US$1,985m in 2019, most revenue is generated in United States. Reading Support With a rate of 15.4%, the user penetration in the Dating Services segment is highest in United States. Here you can find more studies and statistics about "Dating Services".